The institutional repository in the digital library; Establishing a repository; Technologies and technicalities; Workflow and administration; Advocacy; Intellectual property; Case study: The Edinburgh Research Archive. 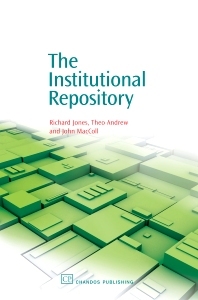 Providing a thorough review of the concept of the Institutional Repository (IR) the book examines how they can be set up, maintained and embedded into general institutional working practice. Specific reference is made to capturing certain types of research material such as E-Theses and E-Prints and what the issues are with regard to obtaining the material, ensuring that all legal grounds are covered and then storing the material in perpetuity. General workflow and administrative processes that may come up during the implementation and maintenance of an IR are discussed. The authors notes that there are a number of different models that have been adopted worldwide for IR management, and these are discussed. Finally, a case study of the inception of the Edinburgh Research Archive is provided which takes the user through the long path from conception to completion of an IR, examining the highs and lows of the process and offering advice for other implementers. This allows the book the opportunity to introduce extensive practical experience in unexpected areas such as mediated deposit. Richard E. Jones has published more than 100 research papers in his field and has received the NIH Research Career Development Award for his research efforts in the study of reproductive biology and endocrinology. In 1990 he received the Student Organization for Alumni Relations Teaching Recognition Award for his teaching of an annual undergraduate course, Human Reproductive Biology, and a course on human anatomy. Dr. Jones obtained his B.A., M.A. and Ph.D. from the University of California at Berkeley. He is now Professor Emeritus of Biology at the University of Colorado, Boulder, where his research interests include reproductive biology as well as reproductive endocrinology. Dr Theo Andrew is responsible for managing the Edinburgh Research Archive, and coordinating the related academic liaison and advocacy activities. John A. MacColl is Head of the Digital Library Division at the University of Edinburgh.